Hair stylists are starting to unveil their latest collections and are making predictions on the haircuts and colours that are going to be big in the next year. Although certain outlandish designs are only destined for the catwalk, there are some bold looks that could be very influential in terms of future trends. The winter trend for green totally reflects the high street fashion wardrobe for the season. It has high shine, and looks healthy, vibrant and strong. It can be worn with the gold, wine and pine green fashions of autumn/winter. Balayage is a freehand technique, as no foils or ‘meche’ are used to create the highlights. The term comes from the French word meaning ‘to sweep’ – balayage has softer, less noticeable regrowth lines than traditional highlights, the principal idea being less is more when creating soft, natural looks. Previously, balayage focused on natural hues, but experts predict that pinks and purples will become more popular. If colours – bright or pastel – aren’t your thing, fear not, we’ll also see a return of ‘disciplined colouring’. People are going to go back to blanket colour, it’s ‘virginal’ hair, to make it look like the colour it was when they were a teenager. As a complement to that, and to stop brown hair fading to a gingery colour, colourists are using blue and green tints so that it’s true flat brown. It’s a massive reaction to all the bright coloured hair we’re seeing, going back to your natural colour. It’s a teenage dream. Pastel panels are one of the latest trends, and a personal favourite. We love this particular diffusion of apricot into seamless minky tones. These colours are great for autumn/winter. This look is created by placing panels in the right order and using a blending technique. Denim hair was a big hit on Instagram this year, but 2019 is going to be all about petrol blue, a more greenish, saturated shade. If you have naturally dark hair and a deep skin tone you’re a perfect fit for this hue. But if you want the colour to last, you may have to bleach your hair first. It does require quite a bit of maintenance. 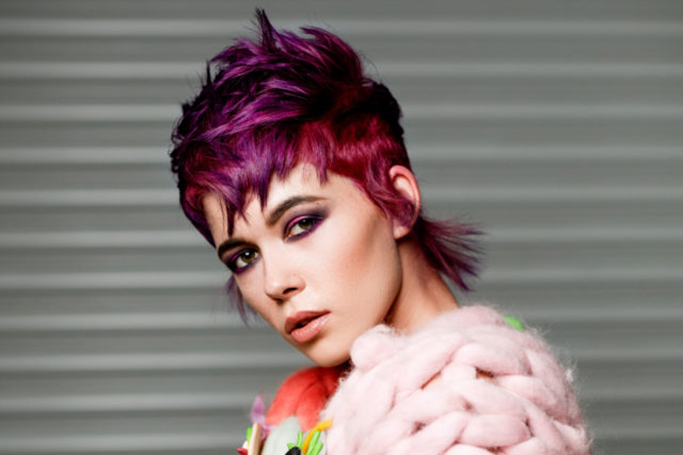 On the model pictured, the hair was bleached first, then toned using L’Oreal Professional Colourful hair range, which is great for any crazy colour. The rich, cherry-esque shade is a nod to the Eighties, but can be worn with most of the season’s fashion trends. It looks great with dusty pink, winter green and lavender. We love the vibrancy, without the risk of washing out the skin in winter when we need all the help we can get. It’s warm, bright and refreshing. For a gentle transition into the new season, shadowy roots are starting to make an appearance. Placing some subtle highlights around the face make this look more polished and deliberate, rather than grown out neglected roots. For blondes, that means more neutral tones, neither warm nor cool, fitting with the deeper roots.